Marc Chagall, an artist who became famous and famous for a series of paintings dedicated to two. The artist spent a long period of his life outside Russia. Despite this, he always considered himself a Russian painter, each time trying to emphasize his clan community with the traditions of Russia. The world-famous “colorful” masterpieces of the master – “Blue Lovers”, “Pink Lovers”, “Gray Lovers”, “Green Lovers” were dedicated to one single beloved by his woman – Bella Rosenfeld. The paintings were created during the period of their marriage with Bella. It was an amazing woman – she had been waiting for her beloved for 4 long years (who just ran away from her bride) while he lived in Paris. I waited and wrote him gentle letters. They had no secrets from each other. 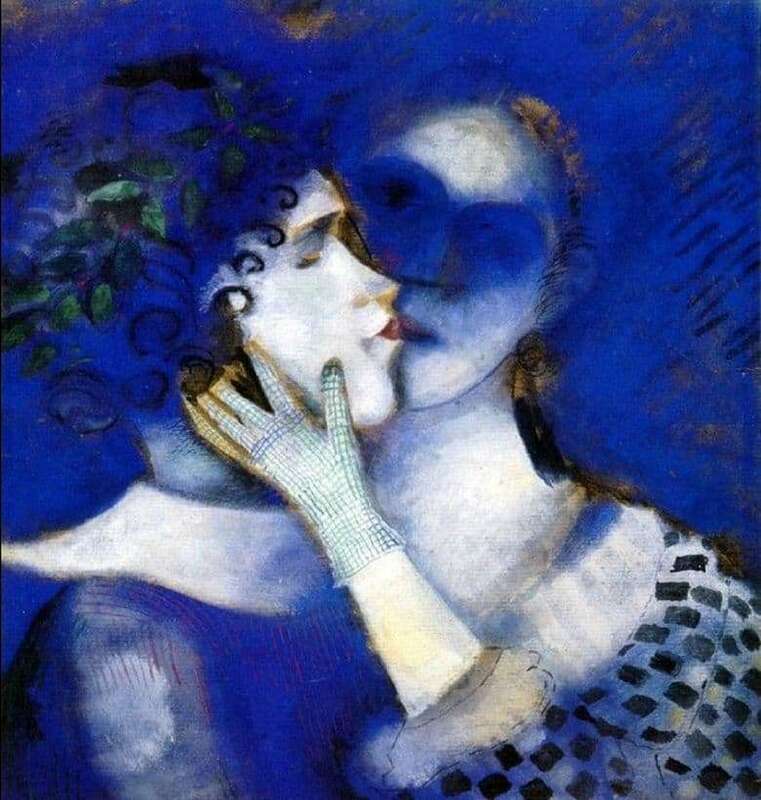 In the picture “Blue Lovers” Chagall depicted human figures as if from dreams. In space, objects swing, bend. Everything can be viewed from different angles. As if in zero gravity. The blue color is the personification of the Mother of God, the kingdom of heaven. Chagall used this color to convey his feelings of love, happiness. As it became known later, from the diaries of the artist, Bella had to approve all his paintings. After her death in 1944, Chagall stopped drawing for almost a year. For the artist Chagall is characterized by subtle brilliance, expressive pictorial drawing, which is filled with spirituality and tenderness. All his paintings can be read if you know the color symbolism that the artist used.